The reliability of Japanese automobiles is legendary. The reliability of Japanese automobiles in Japan, even more so. So what is the secret? Is Japan a country full of obsessive compulsive gear-heads? Or perhaps it is the legendary strict shaken bi-annual car inspection? The strict inspection regime certainly has a lot to do with keeping cars in good working order. But there is another component to the whole system: (semi-) legally obligated car maintenance. Believe it or not, your legal inspection obligations do not end with regular (and costly) shaken (車検) inspections. According to The Man, you are obliged to have your car inspected every 12 months as part of the "legally mandated 12-month check and maintenance" (hotei juni-ka-getsu seibi 法定１２ヶ月点検整備). The criteria in this check is set by the Ministry of Land, Infrastructure, Transport, and Tourism (MLIT) and pretty much covers all the 60 or so points set down in the shaken. If you read a bit of Japanese, Toyota has a good list of what is covered. You may have noticed that just about every car on the road in Japan has a round, disk like sticker stuck on the top left of the front window. 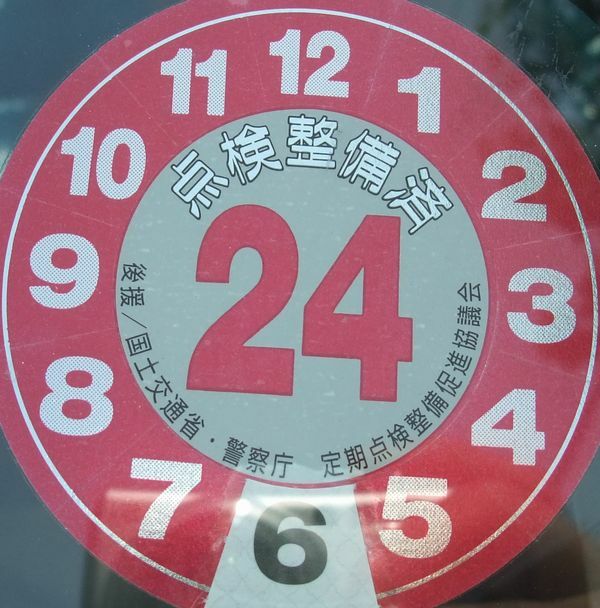 This seal indicates the date your car needs to be inspected, on the rear, indicates the place the car was checked and when it needs to be renewed. The date, like most official business, is written in Japanese years. The seals are usually change color every year for easy identification. This is called the tenken seibi-zumi shiiru (点検整備済シール) and it is issued by the Japan Regular Check and Maintence Inspection Promotion Association (teiki tenken seibi suishin kyokai 定期点検整備推進協会) in cooperation with the National Police Agency (keisatsu-cho 警察庁), and MLIT. In my own experience, the inspection itself costs about 10,000 yen if done at a dealer. This is only the check/maintenance cost. Oil changing, necessary maintenance, and so on cost extra. In some cases, new and used car dealers may throw in a year or two of free checks to sweeten a deal, although this usually only covers the basic costs. Some repairs, however, may be covered under new or used car warranties. It is not uncommon to have this inspection done at the same time as the shaken. Many shaken garages actually include this in the cost of their services. Most car dealers recommend a 6-month annual maintenance regimen which is less through than the 12-month check/maintenance and designed to keep your car running in good shape. In my experience, this costs about 4,000-5,000 yen minus any incidental maintenance. This often includes an oil change. However, word on the Japanese interweb is that most car owners should forgo this inspection as it seems suspiciously like a plot by auto dealers to get more money. The best thing you can do is get your oil and oil filter changed regularly. Believe it or not, you are legally obligated to preform check/maintenance on your vehicle every 12 months. Cars without valid maintenance seals are technically running afoul of the law, but I have never heard of anyone being pulled over on account of an out of date check/maintenance sticker. However, this legal obligation has no penalty attached and the worst thing that can happen is that the shaken authorities will give you a hard time. When going for a shaken you are required to submit a 点検整備記録簿 (tenken seibi kiroku-bo) that lists the condition of all the 60 important areas checked during inspection. This list is usually checked off by a mechanic, however it can be downloaded, printed out, and checked by yourself. Many big cities even have DYI garages where you can check do your own car check and borrow tools for basic repairs. Any other annual maintenance is totally between you and your dealer.